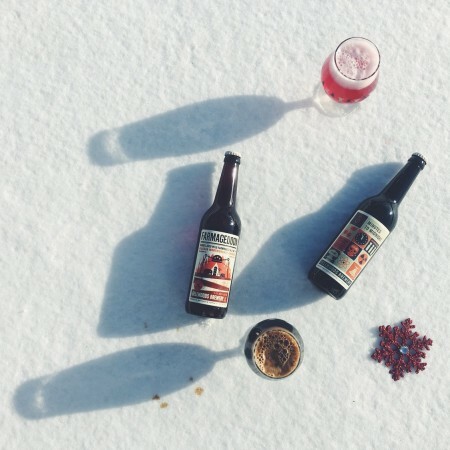 TORONTO, ON – Bellwoods Brewery has announced the return of two popular cherry-infused limited edition beers, with both arriving just in time for last minute holiday shopping. Niagara Montmorency Cherry Farmageddon (6.3% abv): This is a 12-14 month blend of oak-aged, wild farmhouse ales conditioned on a hefty bed of fresh Niagara Montmorency cherries prior to bottle conditioning. Fragrant Montmorency cherries beautifully wrapped up in a light, oaky and subtly tart wild farmhouse ale. Floral/spicy notes, with that characteristic brett funk we know and love in Farmageddon. Finishes dry. 3 Minutes to Midnight (11% abv): This rich and complex imperial stout gains a character that can only come with age (12 months in barrels), aided by the addition of tart cherries and cocoa nibs. Deep roasted flavours merge with cherries to create a complimentary tartness that marries the fruit and malt beautifully. Cherry, smoke, red berry, licorice, port wine and roasted malts on the nose with tart cherry, oak, port and dark chocolate flavours. A true sipper. Both beers will be released tomorrow (December 22nd) at both Bellwoods retail stores – 11:00 AM at Ossington, 4:00 PM at Hafis – and will retail for $14 per 500 ml bottle, with a sales limit of 12 bottles per customer while supplies last.